Spare a thought for residents in Kemerova in Russia who woke in the morning thinking they were right in the middle of WWIII. The mushroom cloud terrified residents who called the police fearing a nuclear explosion had just occurred. The emergency services were inundated with calls as residents feared a nuclear attack. 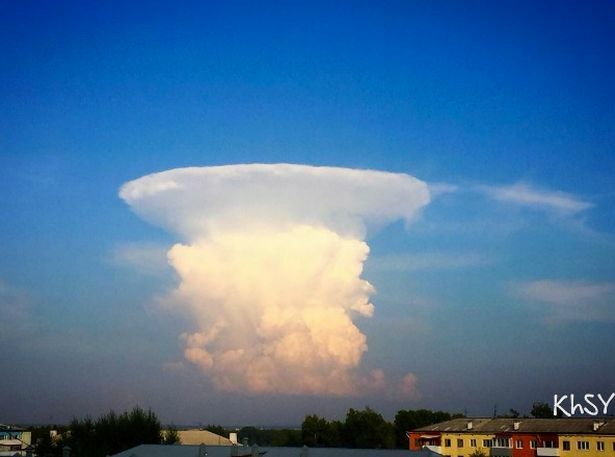 The isolated cloud, in the industrial city of Kemerovo, bore the distinctive hallmark of a nuclear explosion, leading locals to believe that doomsday had arrived. Others reasoned a blast may have occurred at one of the area's many mines, for which the coal-rich Kuzbass region is renowned. In fact what they were seeing was a huge anvil cumulo-nimbus, formed after a thunderstorm caused clouds to be blown to the side. The emergency services quickly calmed down the shocked locals, saying the formation was merely an ordinary rain cloud. Blessings in the name of Yeshua/Jesus.